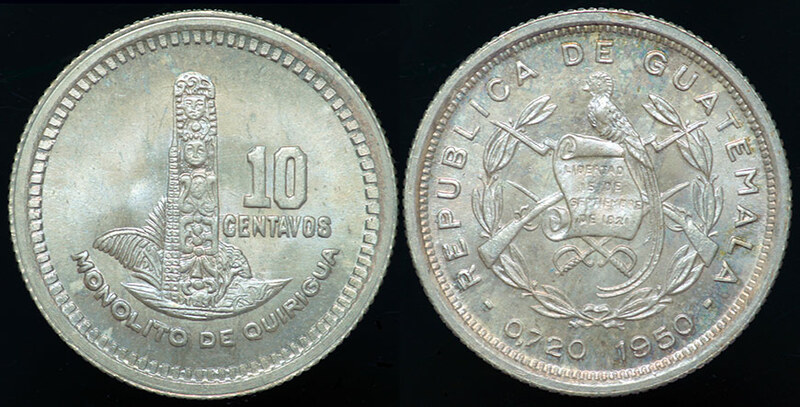 Lovely example of the silver 10 Centavos piece of 1950 featuring the Monolith De Quirigua, which is the largest stone monolith quarried by the Maya. It features the figure of king K'ak' Tiliw Chan Yopaat (say that fast 3 times!). This King had a military victory over Copán in 738 A.D. and the monolith dates from this period. This piece has a very faint irridescent cast over the low grade silver.